Cobalt blue and white | Is This Mutton? The top is from Kaleidoscope and I'm wearing it over a white camisole with white jeans, a white clutch, blue statement necklace and blue denim wedges. The shape of the tunic is not one I would normally choose because I prefer tops to have a more defined waist, and it's not possible to wear a belt with a top like this. Probably why I have never worn it! I picked up the necklace at Topshop a while ago. They have very good jewellery, fashionable and not too expensive so ideal when you just want a particular color for a certain outfit. Outfit: Tunic from Kaleidscope (out of stock, similar, new in, here; white jeans, Boden; white camisole, Pure Collection. Blue wedges, Marks and Spencer (past season); necklace, Topshop (past season). Sharing this post with Patti at Not Dead Yet Style, Catherine at Not Dressed as Lamb, Emma at Stylesplash, Jess at Elegantly Dressed and Stylish, Fancy Friday at Nancy's Fashion Style and Dawn Lucy at Fashion Should be Fun. the top looks beautiful on you! Thanks Tricia, it's not the type of top I would normally wear! This is a beautiful outfit! Wow! And that bag is so perfect! Peace! The color combo is one of my faves, Gail!! And that blue just looks divine on you! It's funny but I never saw that color suiting me, but lots of people are saying it does! Love this colour on you, Gail, and those sandals and necklace finish off the outfit a dream. Hope you went somewhere nice. Just the local, Mary! Such a glam life we lead. Thanks Jacqui - you too! Love the combo! LOve your top! Pretty! This could be one of my favorite looks on you, Gail! 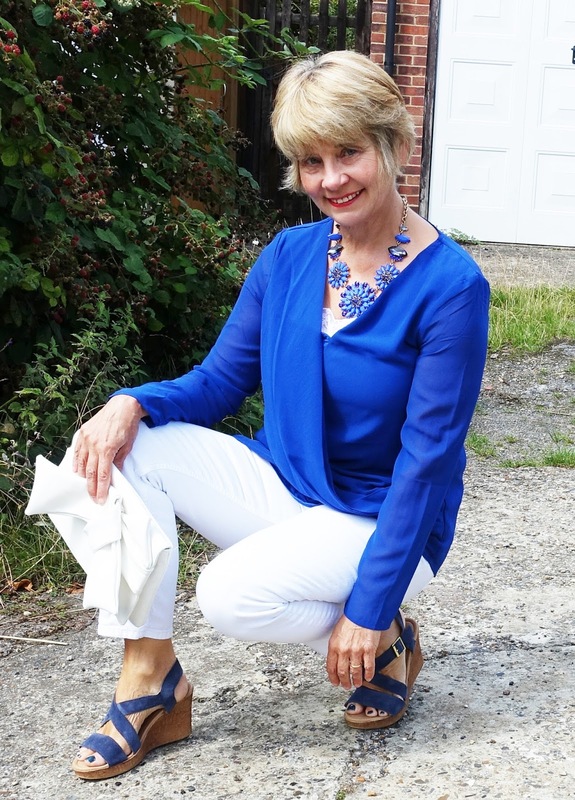 You look stunning in that cobalt blue and I love it paired with your white denim! And that necklace!!! Perfection! Thanks Laurie...the bag has been so useful, goes with everything! What an absolutely beautiful shade of blue. It really, really suits you! Thanks Michelle - it's interesting, I never thought any shades of blue suited me, but maybe this one does. Great outfit. I like the styling. The clutch with the bow is so unexpected, but works perfectly. Thanks for joining the Top of the World Style party. I love this bold colour of blue. Such a pretty color on you. 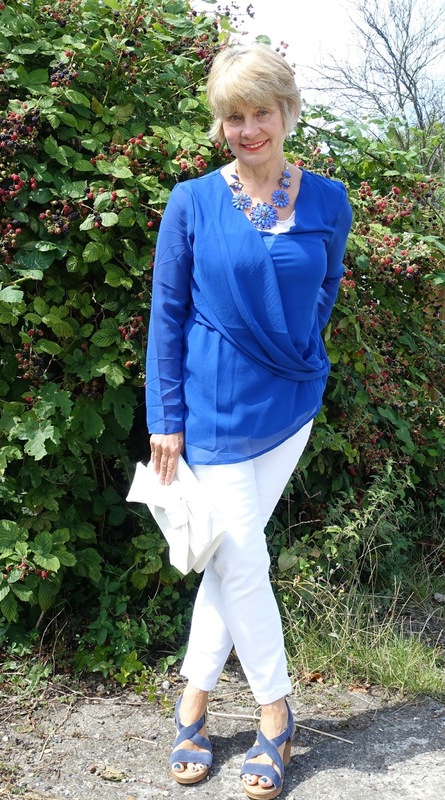 I love the cobalt top and the style, really highlights your beautiful necklace. Love the bow clutch as well.